Had a nice surprise when opening my Post Office box on Friday. 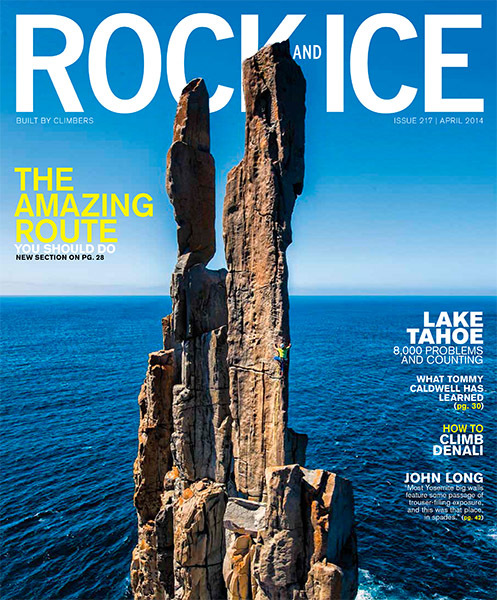 There staring up at me was the latest Rock and Ice Magazine — and with my photo on the cover! Had to look twice. Wasn’t expecting that. Was I dreaming? So I unwrapped it and had a closer look. Yes, it is for real, that cover is glued on there good and proper. Perfect reproduction and several shots of mine running inside too. Stoked! I know, it’s probably funny, that after 20 years in the game I can still get excited about a cover — but I think that’s good – yeah? But Rock and Ice is not just any magazine. They have an awesome team who really know what they are doing and it’s no surprise to see the magazine is going great-guns. I’ve been a contributor for years and am always proud to get my work in there. As always, thank you Rock and Ice for publishing my work! The photo is of Steve Moon climbing Pole Dancer (22) at the end of Cape Raoul, Tasman Peninsula, Tasmania, Australia.